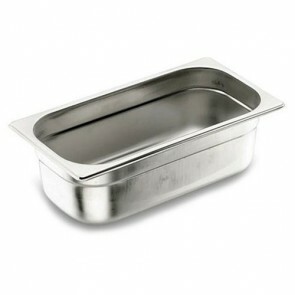 Discover our range of stainless steel gastronorm container/hotel pans of professional quality and available in several sizes and depths. This multi-tasking commercial kitchen equipment is suitable for every stage of food processing as it allows you to transport, cook, heat, cool or store food while meeting the strict sanitary standards of professional cooking. All our gastronorm stainless steel food trays ensure total compatibility with kitchen racks, service trolleys, professional steam tables and refrigerated cabinets meeting the same sizing standards. This catering equipment is perfectly suited to cook food. Designed in sturdy stainless steel, the stainless steel gastronorm container the same properties as most bakeware and cookware items made from the same material. Stainless steel can withstand very large temperature differences from -40 ° C to 300 ° C. It allows you to go directly from the cooking step to freezing without break time which allows you to considerably save time. 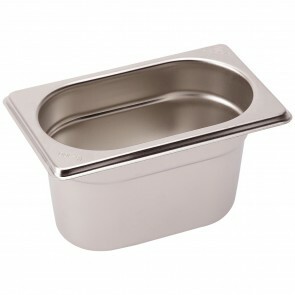 You can even make sous-vide cooking by combining your stainless steel steam-table pan with a gastronorm hermetic lid. It can be used to roast food or for cooking on a steam table. 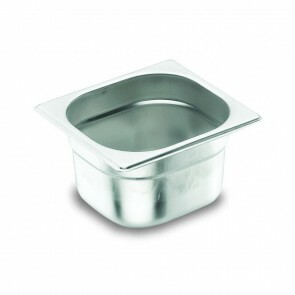 The gastronorm stainless steel containers and trays also resists tremendously at low temperatures. It makes it possible to prepare, preserve and present cold foods. 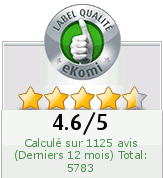 You can use it for refrigeration of food in a cold room or even in a plate cooler. They are perfect as commercial ice-cream display trays. They will be perfectly compatible with the gastronorm ice-cream display freezer. They will also be very useful in cooling cells where they will help to preserve the textures and flavors of refrigerated dishes. These food trays will allow you to transport cold or hot food. 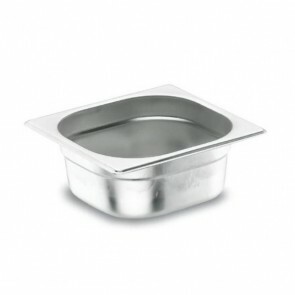 They can be placed on gastronorm food trolleys, gastronorm shelves or in an insulated container. By using a suitable gastronorm container lid which allows you to convert your container into an airtight container you can increase the shelf life of your food during transport as this process slows the fermentation of food. This catering equipment perfectly meets the regulatory requirements for materials and articles intended for contact with foodstuffs. All our GN stainless steel containers are available in several sizes in standard gastronorm (GN) sizing format. You will find 18/10 and 18/0 stainless steel containers. These designations represent the percentage of iron and steel in this alloy. 18/10 stainless steel contains 18% chromium and 10% nickel, while 18/0 stainless steel is made of 18% chromium and 0% nickel. If the chromium composition determines the resistance of the material to corrosion, its nickel composition determines brightness and sagness (flexibility and overall strength) and food neutrality. The 18/10 stainless steel trays and hotel pans are therefore the ultimate in professional kitchen equipment. Az boutique features a range of stainless steel gastronorm containers which will meet the requirements of professional catering. You will also find a variety of other professional kitchen materials and food trays including plastic polypropylene, tritan and polycarbonate food containers. 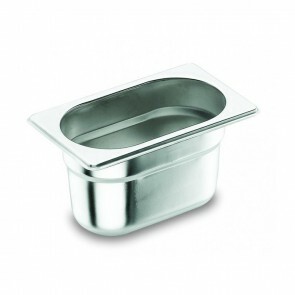 Stainless steel gastronorm container GN 1/9 17.6x 10.8 x 6.5cm/6.6" x 4" x 2.4"
Stainless steel gastronorm container GN 1/4 26.5x 16.2 x 2cm/10.2" x 6.3" x 0.8"
Stainless steel gastronorm container GN 1/3 17.6x 32.5 x 2cm/6.6" x 12.6" x 0.8"
Stainless steel gastronorm container GN 1/6 17.6x 16.2 x 6.5cm/6.6" x 6.3" x2.4"
Stainless steel gastronorm container GN 1/3 17.6x 32.5 x 4cm/6.6" x 12.6" x 1.6"
Stainless steel gastronorm container GN 1/2 26.5x 32.5 x 2cm/10.2" x 12.6" x 0.8"
Stainless steel gastronorm container GN 1/2 26.5x 32.5 x 4cm/10.2" x 12.6" x 1.6"
Stainless steel 18/10 gastronorm container GN 1/4 26.5x 16.2 x 2cm/10.2" x 6.3" x 0.8"
Stainless steel gastronorm container GN 1/4 26.5x 16.2 x 6.5cm/10.2" x 6.3" x 0.8"
Stainless steel 18/10 gastronorm container GN 1/9 17.6x 10.8 x 6.5cm/6.6" x 4" x 2.4"
Stainless steel gastronorm container GN 1/9 17.6x 10.8 x 10cm/6.6" x 4" x 4"
Stainless steel gastronorm container GN 1/3 17.6x 32.5 x 6.5cm/6.6" x 12.6" x 2.4"
Stainless steel gastronorm container GN 1/3 17.6x 32.5 x 5.5cm/6.6" x 12.6" x 2"
Stainless steel gastronorm container GN 1/6 17.6x 16.2 x 10cm/6.6" x 6.3" x4"
Stainless steel gastronorm container GN 1/2 26.5x 32.5 x 6.5cm/10.2" x 12.6" x 2.4"